All change this week with a completely new group of volunteers here to work with us. Once again our work has been seasonally lead, with work in the veg garden and last minute winter proofing being top of the agenda. 1) We’ve been using a lime, sand and clay mixture to repoint the side wall of the house where the worst of the winter rain hits it. 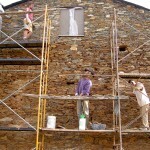 Weather has gradually eroded the original filling and now it leaks so we’re hoping to get this completed before winter. 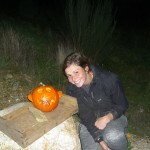 2) Most unusual volunteer job this week has to have been pumpkin carving! 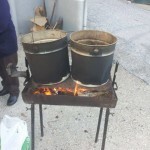 3) A seasonal tradition locally is the magusto, where delicious sweet chestnuts are roasted and jeropiga drunk. Generally they’re cooked in a fire of pine needles on the ground, but these at Melhada do Rei were cooked in metal buckets. 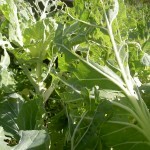 4) Caterpillars have been at our cabbages. The chickens enjoy them once they’ve been picked off by hand, and we find it the most effective organic method on a small scale when done thoroughly. 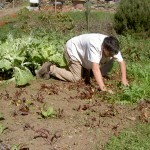 5) Erna spent a couple of days with us and shared some of her huge garden knowledge. Here, she’s getting the broad beans in. 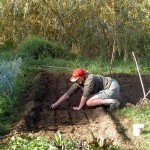 6) We seeded a few patches just before the last period of rain and the weeds grew as fast as the seedlings did. Sam finds that beetroot stand out amongst the green, making the job a little easier!